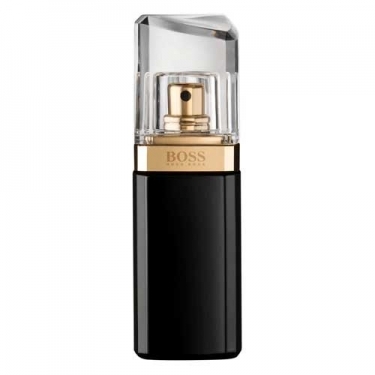 Boss Nuit Pour Femme was inspired by the elegance and confidence of the 'little black dress'. This floral fragrance complements perfectly the sophisticated beauty of every woman. A night fragrance which opens with elegant freshness of peach and aldehydic accords. The heart is a floral burst of white flowers, jasmine and sensual violet with a base of musk and sandalwood. Gwyneth Paltrow stars the campaign. FRAGRANCE: Peach, sandalwood, white flowers, jasmine, violet, moss, and aldehydic notes.